If You’re Not Reading BABYTEETH, Go To Hell | Birth.Movies.Death. Thanks to Comixology, it’s easier than ever to binge read comic books. While past decades would see curious comic book fans hunting down back issues or trade paperbacks if they wanted to jump into an ongoing series and understand what the heck was going on, today readers can take a chance on an issue of a random book and, if they dig it, within moments have the complete series ready to read on the digital device of their choice. 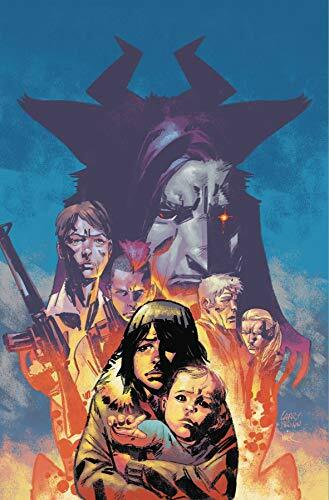 I’m just going to put this out there right now - if you’re not reading Babyteeth, the ongoing comic book series from Aftershock Comics - you might as well just buy the fourteen issues currently available, whether digitally or at your local comic book shop, and get it over with. You’re going to end up doing it anyway. It may not be this year or the next, but this book is going to be part of the modern comic canon and will be a movie or TV show future-you is obsessed with. Jump into the series now if you want to be one of those cool kid early adopters. If you can wait in line to be the first to get an Apple product, you can read the first fourteen issues of a goddang comic book. Babyteeth is a series from writer Donny Cates and artist Garry Brown. The book follows a sixteen-year-old girl who has just given birth to Clark, the antichrist. You know the baby is the antichrist because it has pitch black eyes, the world shakes when it screams and it drinks blood. But all-in-all, Clark seems like a pretty nice baby. And Sadie, his mother, loves Clark very much. She may not have realized she was giving birth to Armageddon incarnate, but she has decided to play the cards she was dealt - and that means loving her monstrous kin with all the affection she has to give. While Rosemary couldn’t trust anybody to protect her and her baby, Sadie has the benefit of a badass pair of family members watching her back: Heather, her hellraising sister who deals drugs and solves problems with the expandable baton she always carries with her, and The Captain, Sadie’s father, a retired marine turned commercial pilot. Together, the three are sent on the run trying to protect Sadie and her newborn son, who just happens to be prophesied to bring about the apocalypse, from the assassins, warlocks, cultists and demons who wish to either kill the boy or bend him to their will. Along the way, Cates and Brown introduce an assortment of fully-fleshed out characters - from a retired hitman and his daughter, who will take on the jobs her father no longer wishes to do, to a mysterious and powerful warlock who is quick to help Sadie and her family but hides deadly secrets from them. 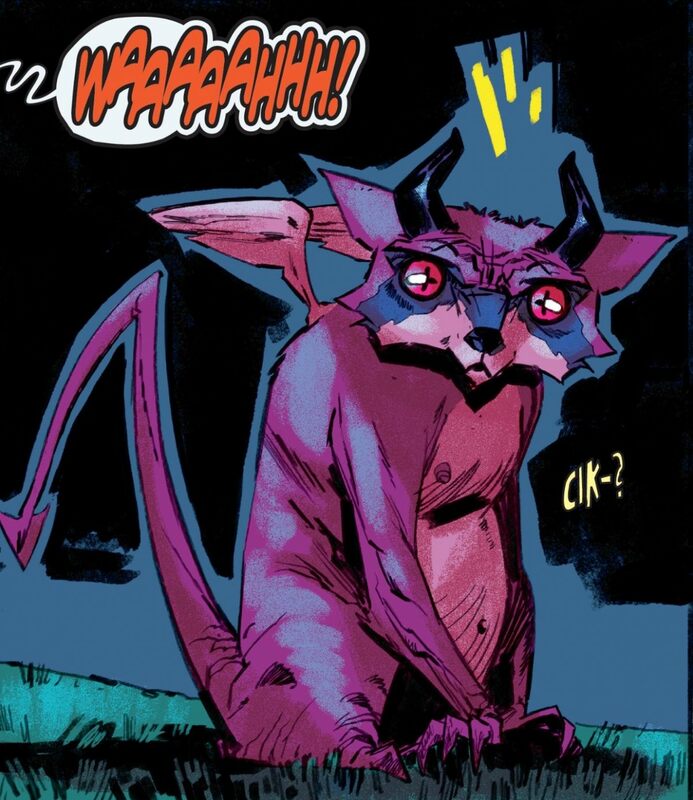 Oh, and there’s a giant purple winged raccoon demon that breathes fire. He’s a hoot! It would be easy to compare Babyteeth to Brian K. Vaughan and Fiona Staple’s Saga as both are wildly unpredictable stories about the lengths parents are willing to go in order to protect their children. Also both series introduce - and often quickly kill in horrific ways - an incredible ensemble cast of characters. Easy, but reductive. Don’t get me wrong, I’m going to ignore the threats of reductive comparisons and evoke Saga because I fully believe most - if not all - of its many fans would love the heck out of Babyteeth too and, you know, Saga is currently on hiatus so that means Saga-fans have some time on their hands to read something new. But don’t think that Babyteeth is merely a Saga clone. 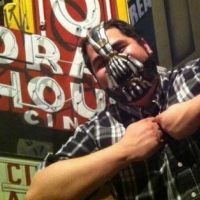 While I fully believe Cates, through his work both in indie comics and in Marvel series such as Thanos and Venom, is establishing himself to be a talent on par with Vaughan, Cates is not attempting to ape the work of another artist and Babyteeth, while sharing many surface similarities to Saga, has its own unique spirit and style. Both deserve a spot on your pull list. 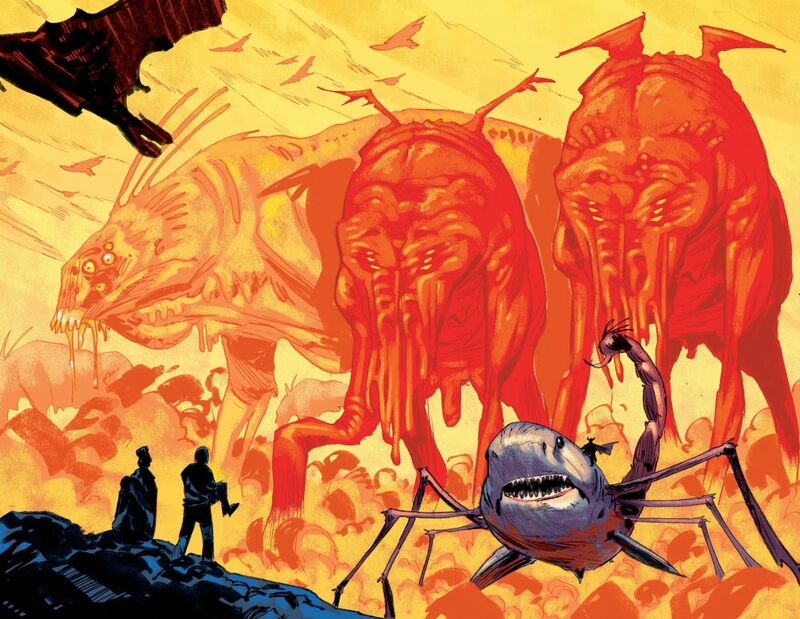 Cates’ dialogue, the unexpected flourishes he gives to the story (Satan rides around on a shark-scorpion kaiju) and the emotional center that runs through Babyteeth shows that Cates has a voice all his own. There’s something sweet and loving that forms the skeleton of Babyteeth, a sense of hope that pierces through the looming tragedy that drapes the series. I mean, I guess the book still has a lot of opportunities to go in some very, very dark places. It has already. But Cates’ love for his characters shines through every choice he makes in the book, even the ones that leave the characters tortured and in despair. Any comic book writers’ words, though, are meaningless without a strong artistic partner at their hip, and Garry Brown has Cates’ back. His artwork melds simplicity and passion, perfectly complimenting the script’s playful approach to the tested tropes of the horror genre. Characters and their emotions are given focus, allowing their thoughts to come across clearly even without reading the dialogue. Brown’s character’s expressions are magnificent and he nails the blend of comedy and tragedy that Cates delivers with his scripts. Clean lines, complimented by crisp colors from Mark Englert offer this book a stylish aesthetic unlike pretty much anything else out there currently. The series reminds me of the work of Bill Sienkiewicz on New Mutants. Babyteeth currently has fourteen issues available with the most recent issue having been released this past Wednesday, and the series shows no sign of slowing down. I would be a sinner if I dived too deep into some of the surprises that await within the series, but know that Cates and Brown have some fantastic and frightening things in store for those that jump on the book. The most recent arc displays a unique depiction of Hell, named the Red Realm, in which giant monstrosities straight out of The Mist march in the distance while post-apocalyptic scavengers, unlucky humans who were sucked into the dimension, try their best not to be devoured by despair or something with slightly more tentacles. Please, please, please - spend some time this month checking out the series for yourself. This book deserves to make Cates and Brown lots of money - but not enough money where they stop pumping out issues and retire to a beach resort. I hope this series last a long time to come and I won’t be satisfied until every child in America is playing with a Tanuki Demon plush toy. Horror fans, this comic is for you! The tale of two damaged, dysfunctional friends trying to do right by each other and battling an evil space god.